To deactivate the crosshair, pleas close the game, and delete the crosshairs.xml in your \res_mods\0.8.2.0\alt_hud folder that is found in your WoWS folder. 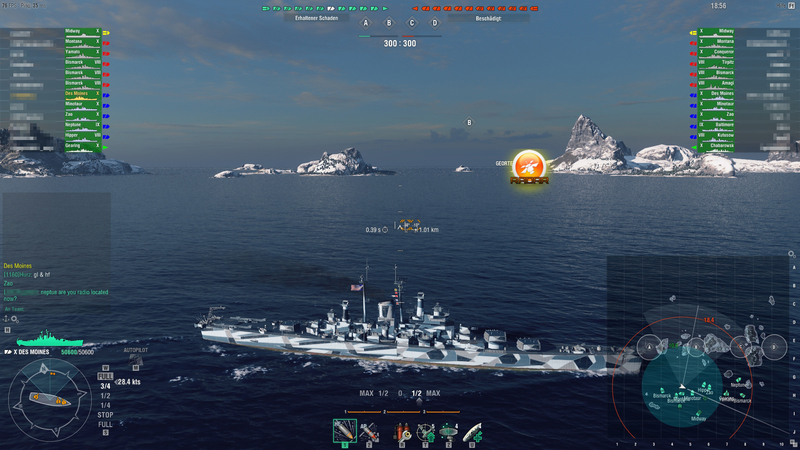 You can change the color of the crosshair by exchanging the crosshairs.xml in your \res_mods\0.8.2.0\alt_hud folder that is found in your WoWS folder with the one out of the color folders that are found there as well. With this you can see what consumables and upgrades are installed on the selected ship as well as you can zoom in much closer on your ships to see mor details. This only effects the harbour view and does not change anything during your battles. This is now back again and does not use the scripts.zip, so all should be fine. Yet the position of the damage panels are not adjustable, but this should come soon. Update to the new version 0.7.0.2 and now moving the damage panel is again possible. Thank you to juger65 and all modders! The new version of the Mod-Pack is now live! Nothing realy changed, besides that the filter for the ships in the harbour are reworked so you can choose, nation, class and tier right above the carousel. And as usual a big thank you to juger65 for updating the mod-pack all the time and who did the translation (into german) of the new main commander mod. As usual juger65 was lighting fast with his work and so the update for the mod-pack was ready 2 days ago. Due to the delay of the patch (for good reasons) the update is now live and ready. Thank you to juger65 for his good work again. A big thanks to Juger65 who did finish the mod-pack right away, even though he is struggling with his health lately. Get well soon! Please send all the best wishes to him and thank him for his work and all the time he spends. Small update to the game and new download for the mod-pack. If you already have the mod-pack installed, you can simply rename the 0.7.5.0 folder to 0.7.5.1 or copy the files. New version with any changes made for the new patch. Just a small update for the 0.7.7.0 Update - all Mods are working. Minimap-Aim-Distance help is now activated. The Modpack is now updated for the new 0.7.8 version, except the damage panels. They are still missing, but being worked on. So i hope in a few days i can update to version V2 of the Modpack, then with the full options.